Still have bug on most played counter. What bug is that, you added some arrows on the screen but didn't explain them? If you mean that playing a song in the 'Most Played' category does not increment the counter by playing it again using that library category, then I believe that is by design. Yes, I mean playing a song again doesn't increase counter . also repeating song in any library or folder doesn't increase this counter. 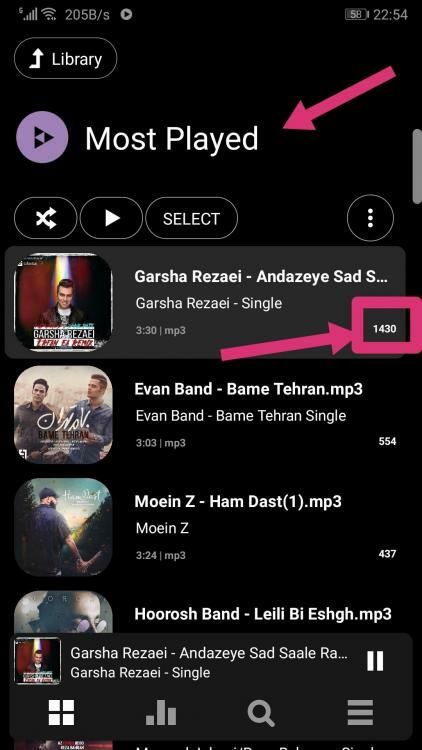 in last versions it doesn't work for me, if put song in repeat once ( song in loop), the counter won't update. in libraries or folders, but when you play normally and in queue, song ends and next song play its OK. I was in android 8 and now Android 9, in both Androids same issue in last versions. in last versions it doesn't work for me, if put song in repeat once ( song in loop), the counter won't update. I could be wrong (Max would need to confirm) but I don't think repeating the same song ten times is meant to increment the play-counter ten times, as it's just another recurrence of the same song. I think I found a bug that when I press the volume button (up or down), the volume would go to zero no matter what the current level is. I think it usually happens when I first open the app. I am using a Galaxy S8+ (G955FD) on Pie, with DVC enabled. I have been having this audio stuttering issue on my Xiaomi Redmi Note 4 since Poweramp V2. Still the issue is persistent, but I have some information that might help. I really hope I can find a fix for this issue. 1) When network is switched from 4G to 3G/2G, vice versa. 2) When the capacitive button lights are shut-off automatically. 3) When another app is opened. This issue is not 100% re-producible, but it happens more often than not. Now, a user on this forum suggested tweaking the buffer size, and surprisingly it worked for me. I set the preset to Huge and the stuttering issue no longer appears. But, side-effect of this is there is a massive delay in response when volume levels are changed and another song is selected. I have tried disabling every other sound effect (MI Sound Enhancer and MusicFX), changing the audio output from OpenSL ES to AudioTrack or Hi-res but nothing works. I also did a complete un-install, re-install-rescan loop but it did not work either. I'm not able to figure out why this issue is happening. The solution is in your bug report if you want to built-in music fx disable DVC otherwise it will conflict with the audio & this is not a new thing I'm using Poweramp since 2012 I remember when I enable DVC + music fx( sound alive) on my s3 it distorted like hell. Now Poweramp v3 has several audio output options & DVC become more optimised and polished that's why your only hearing minor cliks/craks here and there. If you really think Xiaomi music fx is more superior than Poweramp you can use it but you have to disable DVC. 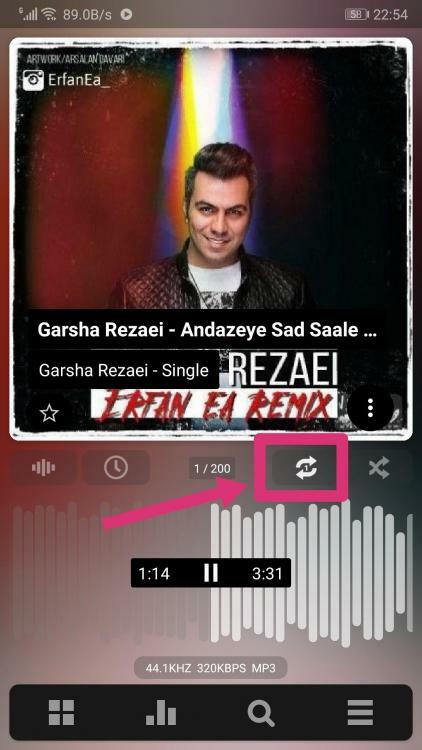 I use Poweramp on my Redmi note 4 uses it's hi res output + dvc & this is the best sound for me. I also tested each and every sound mod on my ancient galaxy S3 DVC never worked on them the only thing I remember Guitar Heroes arise sound mod which works with Poweramp v2+ DVC but it sounds like crap. So it's up to you if you like music fx use if without DVC. @maxmp hi! Are you planning to refine the visualization? I asked questions in the developers branch, but did not get an answer. Hi! I tried disabling DVC but it did not help. Still the audio stutter issue is persistent. It happens a lot when I'm using the phone like, surfing or using social applications and less when phone is idle. Poweramp is tested on Redmi notes, including 4 and there is no stutter for speaker, 3.5 and bt (fiio btr3) on default settings for both Poweramp and system. As for system level effects, that’s another story, as there is little contol over them, but I’ll try to test it vs miui one and will give some recommendations on that. Thanks mate. I'm also trying to figure out why it is happening. I completely disabled DVC, Tone & EQ of Poweramp and disabled the Mi Sound Enhancer as well but still no luck. Another thing I have noticed is the issue happens more often for .m4a files (AAC LC) and less for .mp3 files. Not able to find a reason behind this either. Where we should place files for Max to check - why seekbar showing only small peaks ? Sometime there is biiiig peak in center on track - this understood but maybe there is a way to remove this peaks from main level ? And there is tracks where peaks not present, but shows incorrect. Place them here, on mail, or in separate topic ? You think it just not stretched at all ? song plays and also its need to increase the counter. I think it's right to increase, because in most played you see how much does a music played and it will be good and also in my opinion to increase counter. @misagh97 "Repeat one" mode doesn't increase counter actually by design - it's not a bug. I can change this behavior, but what is the reason for a such change? As for incrementing # of playbacks in most played, this will re-sort most played list on each playback and it's unmanageable (tracks jumps to top making list unusable). @Sierrarohan so I listened to my Redmi 5 (pro, @7.1.2 / MIUI Global 9.6), used 3.5 output, (default) Open SL output on standard settings + added Mi Sound Enhancer (it's just a device built in equalizer presets). Poweramp is super stable on this device. What is your device exactly (there are many variants)? Are you on stock OTA ROM? When do you hear those stutters - during background (screen off) playback or during some phone activity, e.g. in browser? Does stock music player stutter for you? Have you changed Poweramp settings in Battery & performance / Choose apps / Poweramp? (I have "Battery saver (recommended)" there, but as phone can see I use Powermap only, it gets kind of priority, so for your case you may need to use "No restrictions" + do this for Poweramp Full Version Unlocker as well - if you're on Poweramp Play variant). I think I have found a bug. I was just listening to Michael Jackson's Thriller album. I selected Beat It, and it played through into Billie Jean. But my in-car display continued to display Beat It as Billie Jean was played. (I parked the car and the player stopped at that point). Now I just looked at my phone and Beat It was displayed on the screen, and seemed to be paused on that song? I'll test this again next time I go for a drive and see if I can repeat it. Hey Max, my device is the Indian version of Redmi Note 4 i.e. with Snapdragon 625, running latest stable MIUI 10.2.3.0 on top of Android 7.0. No root, no unlocked bootloader and no mods whatsoever. I use it with OpenSL output and Mi Sound Enhancer as well. (There is additional MusicFX app, perhaps the Snapdragon's default equaliser which is accessible through MusicFX option in Poweramp, I use it sometimes). I have tried disabling everything mentioned above since it was suggested by a member here, but it did not work. I usually hear stutters when I am using the phone, like browsing a website, opening another app like Instagram or whatsapp, when the device is switching between 4G/3G/2G networks (75% of the time, this is the case) or even when the backlight of capacitive buttons is switched-on/off automatically. Stutters are more common when I'm using the phone and less when the screen is off, but they are there. It happens on 3.5, BT and speakers as well. Stock music player never stutters for me, as well as JioSaavn (An audio streaming app which plays local files as well), this is why I'm puzzled. I have kept 'No restrictions' on both Poweramp & the full version unlocker because I thought MIUI battery saver is somehow messing with Poweramp, but even after that the issue is still happening. Only thing I have found working till now is increasing the buffer size to 'Huge' preset. But then there is a huge lag in response to changing volume levels and changing of song. Otherwise Poweramp is very stable, no lag, no hiccups whatsoever. This audio stutter issue is the only thing that is annoying.